Birthday card make and printing software provides you full flexibility and ability to create lovely birthday cards only in few easy steps and improves your work efficiency as well as your business in cost effective manner and without making extra efforts. 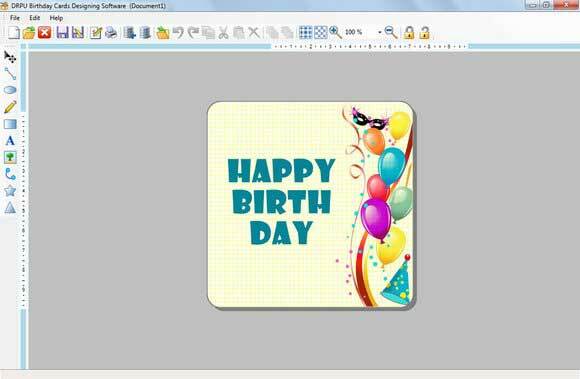 Flexible and interactive card creator utility gives you solution to produce standard, high resolution, attractive and colorful birthday cards at very low price. Convenient card maker program facilitate you to design cute cards in various shapes and sizes as per your choice. With the help of advanced birthday card maker and print utility you can modify your existing cards in easiest way without having any technical skill. Easy to use card maker tool enable user to design and print supreme quality and amazing cards with their fewer efforts. Professional card maker software assist user to build stunning birthday card in effective way. Birthday card creator application provides the way to produce bulk copies of same birthday cards easily and takes no extra charges for it. Technically efficient and reliable card maker tool is organized with highly interactive graphical user interface. Automatic freeware card design program is compatible with almost all major brand of Windows Operating system like Windows XP, Windows VISTA and Windows 7 etc. compatible and convenient card maker application facilitate you to craft eye catching, awesome, cute and attractive birthday cards with advanced feature like insert photo, best wishes and text messages etc. Best freeware card design utility provides you advance image designing tools to fulfill your all kind of birthday card requirement at reasonable price with your minimal efforts. Extraordinary Features: * Enable you to produce cute and nice cards in simplified way. * Provides you advanced features to include photos and text messages with your card. * Help user to craft eye catching birthday cards.